when do we have to send the stuff by? Cuteness!! I LOVE the strawberry!! 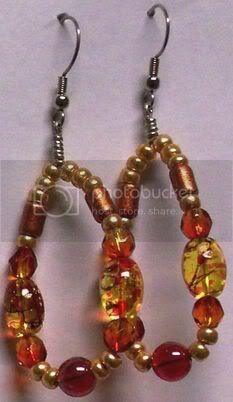 Pretty, pretty earrings. Working with wire is fun, isn't it? I haven't done much with wire, but a big thing on my wishlist is a WigJig cyclops. I would LOVE to be able to make consistent whirls and swirls. I made some bangles the other day (fun, and not too hard), and some arms and legs and a tail today with wire. It's a blast! How about show some more of your work!!??!! I love working with wire, even if it doesnt love working with me all the time! I never even knew what a wigjig was until last week! I was thinking that I could make my own! I've made one other bracelet that I have yet to take a pic of - I'll post it when I get it! 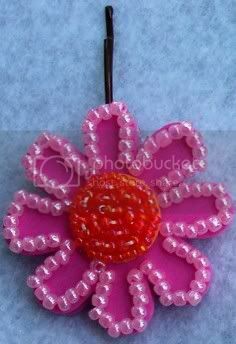 What did you use for the back of the pin (the red/pink part that the beads are stuck to)?? Thank you!! I used two precut foam shapes - super easy! Coolness! I'd love to see what you create! !